Speed: Performing a yum (or dnf) update from one of your locally hosted repositories is much faster than checking the ones on the internet! Cost: If you run a business, then you know bandwidth can be expensive. If Linux is the operating system your developers and/or employees use, then hosting the repository internally means they won’t waste bandwidth each time one of them performs a system update. You’ll have downloaded everything once, and provided a central controlled share point they can apply all of their updates from. Retention: Over time, your successfully deployed systems will age and the packages that were once readily available for it may be a lot harder to acquire! Sometimes it’s a good thing to create and manage your own internal repository so that you always have access to the exact RPMs you used to deploy/create your development environment with. This is especially the case for that one rare day that arises requiring you to go back and debug a legacy system of yours. If the packages are already available to you locally; you should have no problem reproducing any detected problems since you’ll be able to reconstruct their environment exactly. Mock: I love this tool; mock allows you to dynamically generate different distributions of CentOS/Fedora (new and old) allowing you to build your applications to test them in it. You simply create a mock environment of the distribution of interest. In this new environment, you can do whatever it was you wanted to, then you can easily blow it away when you’re done. The best part about mock is that it allows you to build/test things without hauling in all of the development libraries into your native working environment. Quite frankly, I couldn’t have hosted or tested half of the things I do in all my blogs and my repository without it. Mock generates it’s ‘throw/away’ environments by connection to a yum repository and setting itself up. If you host your own repositories, it can greatly speed up this process. Consistency: If everyone in your department were to reference the same rpm repository instead of one of the hundreds of mirrors available on the internet, you would consistently be hosting and sharing the same packages internally with your team. This is fantastic in a software development environment where everyone should be using the same packages anyway. This isn’t to say that all public CentOS mirrors are different, but they do go up and down from time to time. They also all synchronize themselves with whatever the latest and greatest at different times too. Mirrors: Even if you just host your own mirror publicly, you’d be doing the Linux community good! You’d become another server of the hundreds already out there providing a source for free software! Your efforts would offload network congestion others face and speed up everyone’s Linux experience. Custom Media: Hosting your own RPM packages can grant you the power to build your own custom media. You can accomplish the same task without hosting internally, but it’s much (,much) slower! This will make for a great topic in another blog though since this process is a topic of it’s own. I do however explain how to host your own custom repositories in this blog though! The whole hosting process will take up some disk-space… 150GB or so if you decide to host everything I identify here. Nothing major, but worth noting for those with smaller disk drives. The location we’ll host the repository from. The location we’ll store our ISO image files in. The next few sections focus on the following repositories; you may or may not need them all. So feel free to just use what you need. Note: The blog utilizes the lftp tool for all of the synchronization, but the rsync command is also documented in the comments if you prefer that route as well. It’s also worth noting that you can re-run these mirror commands again and again to keep your local repository updated with the latest. lftp mirror.csclub.uwaterloo.ca -e "mirror --verbose /centos/5.11/updates/x86_64/ /var/share/repo/centos/5.11/x86_64/updates"
lftp mirror.csclub.uwaterloo.ca -e "mirror --verbose /centos/5.11/extras/x86_64/ /var/share/repo/centos/5.11/x86_64/extras"
lftp mirror.csclub.uwaterloo.ca -e "mirror --verbose /fedora/epel/5/x86_64/ /var/share/repo/centos/5/x86_64/epel"
lftp mirror.csclub.uwaterloo.ca -e "mirror --verbose /centos/5.11/updates/i386/ /var/share/repo/centos/5.11/i386/updates"
lftp mirror.csclub.uwaterloo.ca -e "mirror --verbose /centos/5.11/extras/i386/ /var/share/repo/centos/5.11/i386/extras"
lftp mirror.csclub.uwaterloo.ca -e "mirror --verbose /fedora/epel/5/i386/ /var/share/repo/centos/5/i386/epel"
lftp mirror.csclub.uwaterloo.ca -e "mirror --verbose /centos/6.8/updates/x86_64/ /var/share/repo/centos/6.8/x86_64/updates"
lftp mirror.csclub.uwaterloo.ca -e "mirror --verbose /centos/6.8/extras/x86_64/ /var/share/repo/centos/6.8/x86_64/extras"
lftp mirror.csclub.uwaterloo.ca -e "mirror --verbose /fedora/epel/6/x86_64/ /var/share/repo/centos/6/x86_64/epel"
lftp mirror.csclub.uwaterloo.ca -e "mirror --verbose /centos/6.8/updates/i386/ /var/share/repo/centos/6.8/i386/updates"
lftp mirror.csclub.uwaterloo.ca -e "mirror --verbose /centos/6.8/extras/i386/ /var/share/repo/centos/6.8/i386/extras"
lftp mirror.csclub.uwaterloo.ca -e "mirror --verbose /fedora/epel/6/i386/ /var/share/repo/centos/6/i386/epel"
lftp mirror.csclub.uwaterloo.ca -e "mirror --verbose /centos/7.2.1511/updates/x86_64/ /var/share/repo/centos/7.2/x86_64/updates"
lftp mirror.csclub.uwaterloo.ca -e "mirror --verbose /centos/7.2.1511/extras/x86_64/ /var/share/repo/centos/7.2/x86_64/extras"
lftp mirror.csclub.uwaterloo.ca -e "mirror --verbose /fedora/epel/7/x86_64/ /var/share/repo/centos/7/x86_64/epel"
You can easily take the examples provided here and alter them for other repositories you wish to host. # Lets presume we want to start a custom CentOS 7 (64-bit) repository. # Okay... now you can drop all the RPMs you want into this custom repository. # just copy them in; no strings attached. # need to run the below command. #   A simple script for creating a repository directory. echo "You must specify a repository directory to scan (containing rpms)." cat << _EOF > "$COMPS"
cat << _EOF >> "$COMPS"
# Now we can copy our rpms into this directory at will. You're done! Now you can update your <strong>/etc/yum.repos.d/</strong> to include this new location with each yum call you make! Just use the other examples already provided in this blog as a template! <a href="https://github.com/rpm-software-management/mock/wiki" target="_blank">Mock</a> is a fantastic tool for RPM management. It's also a great tool for someone who just wants to test and see if they're code will run on another platform. You could almost think of Mock as a poor man's <a href="https://linuxcontainers.org/" target="_blank">Linux Container</a> which are pretty popular these days. Mock isn't as contained, but it can accomplish the same feat and is even faster since it doesn't have the (Linux) container overhead. # out of your internal epel repository! Nice! # (a non-root user). This user will be granted mock privileges. Just like that' you're now ready to create mock environments. Now by default, mock is configured to fetch it's information from the external repositories on the internet. But it's configuration is really easy to get ahold of and update. Check out the /etc/mock directory. You can now edit the mock environment you wish to host and optionally update the repositories to point to your own. For example, pick a file like /etc/mock/epel-7-x86_64.cfg which is used to generate a 64-bit Enterprise Linux (RedHat/CentOS) 7.x environment. You'll see entries like this which will look very familiar (it's a yum/dnf configuration file entry just like the ones identified above). You can comment out the mirrorlist entry and swap it with your own local repository. You can also just copy and paste one of the config files to another and change it around. Add repositories, remove some; the config file for mock is really straight forward if you use another as a template. Mock is pretty straight forward to use. You just need to pass it in the environment you're using with each call you make to it. # The above command works because a /etc/mock/epel-7-x86_64.cfg file exists. # to return back to your normal environment. # our new RPMs for CentOS 7, it places them into a directory called 'awesome.app'. Mock: A fantastic development tool that allows you to dynamically generate a fully functional development environment for a CentOS/Red Hat/Fedora distribution of your choice. It allows you to keep development libraries out of your native (working) environment keeping things clean. CentOS 5.x, 6.x and 7.x: Here is a list of all of the mirrors you can sync from. Extra Packages for Enterprise Linux (EPEL): CentOS/Red Hat users shouldn't be without this one. It has tons of the building blocks you might need to reconstruct things with. NuxRef: Yes... my repository; I mean why not, right? Fedora: Bleeding edge distributions don't stick around long. After a year or so, you'll be hard-pressed to find RPMs. It might be wise to mirror the distribution you're using if you don't plan on upgrading anytime soon. There is enough information in this blog to mirror a Fedora repository if you want to do so. This entry was posted in Uncategorized and tagged Centos, dnf, epel, Fedora, Hosting, Linux, Mock, Package, Red Hat, Repository, RHEL, RPM, yum on October 6, 2016 by l2g. 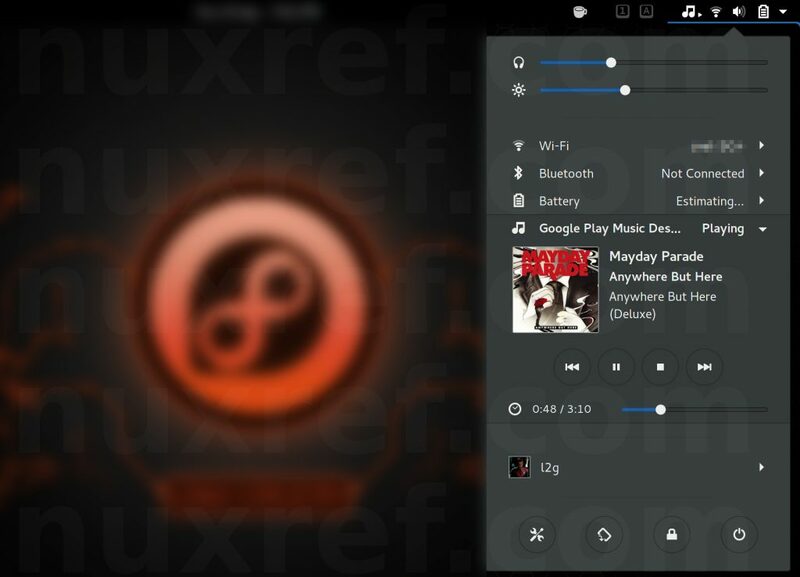 Google Play Music Desktop Player (GPMDP) is an amazing application. Instead of opening up a browser every time to access your Google Music account (and songs), you can integrate it into your desktop experience instead. One of the best features GPMDP offers is the fact it becomes a standalone application and no longer requires you to have to deal with the memory hogging web browsers (especially Chrome) uses to stream your favorite music! Smooth scrolling and overlay scrollbars for a nicer user experience. HTML5 Audio Support – No more Adobe Flash Player! Customizable hotkeys for those who don’t have media keys. Choose your audio output device from within the player. I set up this blog because the RPMs distributed from GPMDP’s official website didn’t work for me. So I just ended up repackaging the whole thing and thought I would share my success. Pair this application with the Gnome Media Player Shell Extension and you’ll allow even get desktop notifications when songs change. 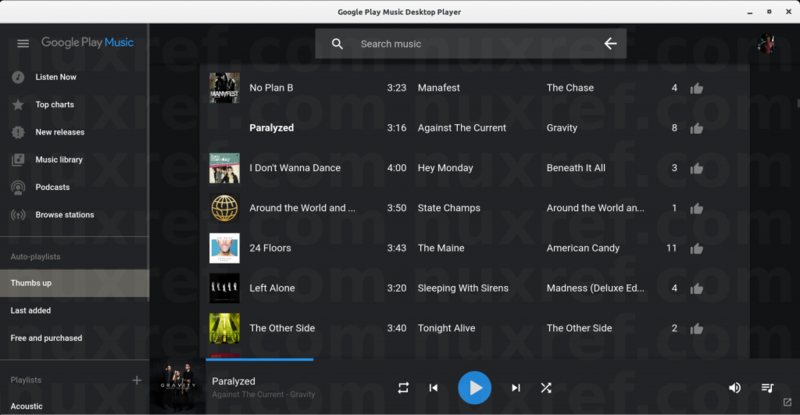 Google Play Music Desktop Player Official website and GitHub Page. Gnome Shell Media Extension and GitHub Page. This entry was posted in Linux HOWTO, Missing Linux Packages and tagged Centos, Desktop, dnf, Fedora, Google Music, Google Play, GPMDP, Linux, media, Music Player, nodejs, Red Hat, RPM, yum on April 20, 2016 by l2g.